Ireland's Jonathan Sexton celebrates winning against France. THE FOLLOWING PASSAGE is an extract from ‘No Borders: Playing Rugby for Ireland 2018 Grand Slam Edition’ by Tom English. 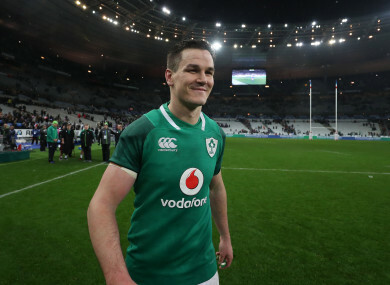 After 71 minutes of Ireland’s opening match of the 2018 Six Nations against France in Paris, Joe Schmidt’s team were ahead in virtually every statistical category you could possibly think of bar the one that mattered the most. They had dominated possession and territory in a way they had never done before in all their years visiting the Stade and yet when the wing Teddy Thomas sliced his way through their defence and carried on all the way to the Irish try-line the French, with a new coach and six new caps in their ranks, suddenly held a 13–12 lead. A few weeks earlier, Rory Best had addressed his players at a training camp in Spain and had spoken about their pursuit of a Grand Slam. Best said he wasn’t going to labour the point and neither was he going to breathe a word of this outside the four walls of the team room, but he pointed out that 2018 had to be all about a Slam. dressing room later and there’d be no better feeling. And he was right. were going to win, but we were losing and we didn’t have a lot of time left. more chance. And sometimes you don’t get another chance. the ball was greasy and it was quite slow coming out of those rucks. CJ Stander: I’ve been in that situation a lot of times with a lot of different teams. Late in the game and you need to find something. You need to work your way up the pitch and get field position and execute. You know how many times I’d been on a team that actually went back out and did what we said we were going to do and won the match? Zero times. There are so many ways it can go wrong. The referee can penalise you, somebody can drop the ball, an opponent can steal the ball, you can try a drop-goal and miss. The biggest fear for me, and it was the wrong way to think about it, was that I was going to be the one who knocked the ball on and cost us the game. The rain was coming at us. The wind seemed to be getting up, but we restarted and Iain Henderson got the ball back and that was stage one. We kept going and going and it got to a point where it was boring. Carrying and carrying. Ruck after ruck. After the seventh or eighth phase you just switch off and go into a deep, dark place where all of us have been before. You just keep pushing until something happens. After a while I got too tired to worry about dropping the ball and I just put my head down. Iain Henderson: CJ talks about going to a dark place, a place where you’re far from your comfort zone, where you’re doing things that you don’t feel capable of doing, then you produce another one and another one. Just when you think you haven’t anything left to give you find another bit and another bit. It’s the mental battle you’re constantly having with yourself to make sure your work rate stays high. Devin Toner: I was blowing. I felt like I’d played the whole game instead of just 10 minutes. Dan Leavy: The more work you do the less the team has to do. I was just trying to stay in the game as much as I could. You roll up the sleeves and go again. Devin Toner: He’s some man, Dan. He always ends up with some sort of scar on his face, a big bulging eye and blood coming out of him. He’s a tough cookie. Rory Best: I was off the pitch at that stage – and I was very nervous. I was sitting down and I was going through what I was going to say in the press conference post-match. How was I going to explain it given that we’d dominated the game pretty much from the start. On the sidelines, you’re powerless. You have no control and when you’re used to having control it’s horrible not having it. There’s pressure on the players on the pitch in having to execute things while knowing that if you drop it or get turned over then it’s curtains, but I’d much rather that than being helpless. I’d much rather have the chance to control my destiny, but that’s what we have a squad for. Seanie comes on and does a lot of things that I can’t do. He gives you that impact and dynamism. You need that versatility coming off the bench. Rob Kearney: You’re on high alert, you’re worrying about your own job and you’re trying to make the job easier for other guys, even if it means just running a line trying to hold a couple of French defenders or trying to hit the breakdown a little bit earlier to make sure the ball is secured. We practice those moments a huge amount. Keith Earls: It was actually a perfect kick because it made me come in off the touchline. If it was any closer it probably could have been easier for them to knock me into touch. Felix Jones [Munster’s attack coach] has a good saying: ‘If you’re stuck out wide on your own you have to fight like a rat in a corner.’ That stuck in my head as I was waiting for support to come. Rob Kearney: The crossfield kick goes in and we start to get a little bit of impetus. Devin Toner: We got to 30 phases, 31 phases, 32 phases. Any passage of play that goes on that long is knackering. You go into auto-pilot. The adrenaline gets you through. You know you can’t drop the ball and there is a thing in the back of your head telling you that this game is too big to mess up. You’re sticking it up your jumper and driving as hard as you can. 38 phases, 39 phases, 40 phases. Iain Henderson: These habits are drilled into us when we train. You make sure your shape is right coming round the corner, you have faith that you will have somebody cleaning on your inside and somebody cleaning on your outside. It’s just about having massive faith in the boys around you doing their job. Rob Kearney: I saw Johnny down on the ground stretching because he was cramping, so I thought, ‘Right, clearly we’re not having a shot at goal here because he’s stretching. Then we got to their 10-metre line and we’re up to 41 phases. From nowhere he calls for it. Conor Murray: We looked at each other two or three times when the forwards were picking and going. I knew exactly when he wanted to take it on. He just gave me a flick of the eyebrows. Devin Toner: I thought he was too far out. I thought there was no way he was banging it over from out there. CJ Stander: I was at the bottom of the ruck but I could see Johnny getting ready. That’s a tough job. I don’t want that job. I don’t want to be the one who has to land that drop goal. It takes a special type of person to cut out any negativity, to cut out the weather and the crowd and the pressure. That kick is difficult enough in training. He was doing it in injury time in a Test match in the rain in front of 80,000 people with everything on the line. Johnny Sexton is swamped by his teammates after kicking the winning drop-goal against France. Rob Kearney: I wasn’t expecting him to pull the trigger, but the boys had been trucking it up for more than four minutes so he would have been factoring that in as well. They were fatigued and fatigued players make mistakes and we couldn’t afford a mistake, so he took it on himself. From my angle, it was looking a little short, but then it just kept going and going. Conor Murray: I knew when he struck it, it had the legs. It’s a moment I’ll remember forever. Dan Leavy: Johnny – the biggest balls on the planet. Joe Schmidt: Pure resilience and steel. Iain Henderson: I chased after the drop-goal and I felt like I was really moving but looking at it again I wasn’t actually going that fast at all. I saw Nigel Owens’ hand going up to signal that the kick was good and I looked back and everybody was running towards Johnny. Then I started to run towards him but I couldn’t carry myself properly. By the time I got to him, everybody had dispersed. Rob Kearney: In the changing room everyone was just looking at each other with a little bit of disbelief that it had actually happened. As a single moment of joy, Johnny’s drop-goal was by far the best of my career. Rog’s drop-goal in Cardiff in 2009 was absolutely massive, but the game’s not over when he lands it, you still have to stay tuned-in. The euphoria of that winning kick in Paris was the best feeling ever. Joe Schmidt: It’s pretty hard to explain how you feel when you think the game has got away and suddenly you’ve grabbed it. It was fairly inspirational. Rory Best: It’s funny how a kick of the ball after eighty-two minutes of rugby can change your mood. Everybody was on a high, but if Johnny’s kick had hit the post the pressure the following week would have been unreal. We’re talking inches between absolute joy and absolute despair. ‘No Borders: Playing Rugby for Ireland 2018 Grand Slam Edition’ by Tom English is published by Polaris Publishing. More info here. Email “'Johnny – the biggest balls on the planet'”. Feedback on “'Johnny – the biggest balls on the planet'”.